The applications of eye-tracking devices are endless, which is why we always get excited to see new techniques in measuring the absolute position of the human eye. Cornell students [Michael and John] took on an interesting approach for their final project and designed a phototransistor based eye-tracking system. We can definitely see the potential of this project, but for their first prototype, the system relies on both eye-tracking and head movement to fully control a mouse pointer. 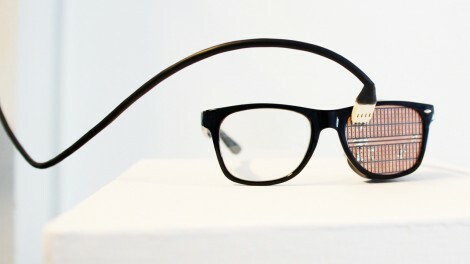 An end-product design was in mind, so the system consists of both a pair of custom 3D printed glasses and a wireless receiver; thus avoiding the need to be tethered to the computer under control . The horizontal position of the mouse pointer is controlled via the infrared eye tracking mechanism, consisting of an Infrared LED positioned above the eye and two phototransistors located on each side of the eye. The measured analog data from the phototransistors determine the eye’s horizontal position. The vertical movement of the mouse pointer is controlled with the help of a 3-axis gyroscope mounted to the glasses. The effectiveness of a simple infrared LED/phototransistor to detect eye movement is impressive, because similar projects we’ve seen have been camera based. We understand how final project deadlines can be, so we hope [Michael and John] continue past the deadline with this one. It would be great to see if the absolute position (horizontal and vertical) of the eye can be tracked entirely with the phototransistor technique. In addition to being a great replacement for that aging eye patch, these specs act as a light switch. By watching your eyelids, they are able to kill the lights whenever you blink. The installation is a shared experience piece conceived by [Michal Kohút]. He wanted to illustrate the constant blinking we all do but rarely think about. The system uses an Arduino to capture events from the blink sensors and switch the lights accordingly. This way the wearer doesn’t experience a loss of illumination, but the observer does. Check out the video after the break for a quick demonstration. One of the commenters from the source article shared a video link to another blink-based light project. That one uses electrodes attached to skin around your eye in order to detect eyelid motion. Researchers at Georgia Tech have developed a biologically inspired system to control cameras on board robots that simulate the Saccadic optokinetic system of the human eye. Its similarity to the muscular system of the human eye is uncanny. 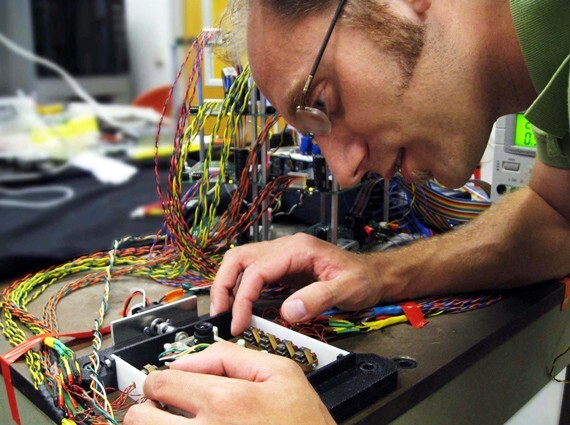 Joshua Schultz, a Ph.D candidate, says that this system has been made possible in part to piezoelectric cellular actuator technology. 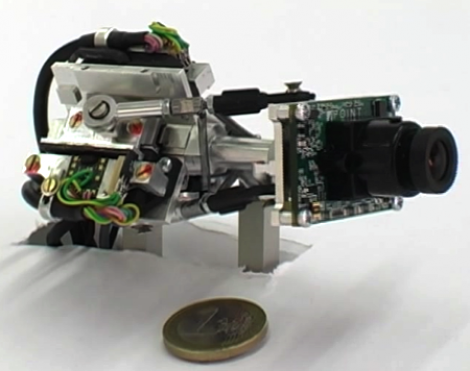 Thanks to the actuators developed in their laboratory it is now possible to capture many of the characteristics associated with muscles of the human eye and its cellular structure. The expectation is that the piezoelectric system could be used for future MRI-based surgery, furthering our ability to research and rehabilitate the human eye. 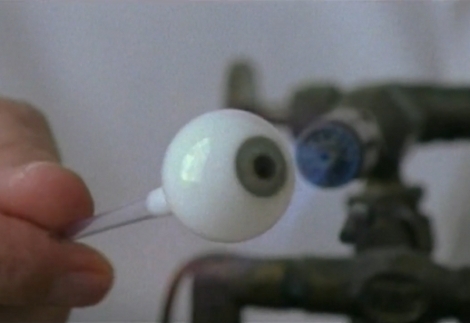 Here’s a story of an ocularist who makes prosthetic eyes from glass. Obviously here’s a necessary and important service, but we find it surprising that this seems something of a dying art. [Mr. Haas] lives in the UK but notes that most glass eye makers have been German, and tend to pass the trade down to their children. With that father-to-son daughter transfer of knowledge becoming less common these days we wonder just how many people know how to do this any longer. But don’t despair, it’s not that there won’t be a source for ocular prosthesis, as acrylic eyes are quite common. But what we see in the video after the break is breathtaking and we hate to see the knowledge and experience lost the way vacuum tube manufacture and even common blacksmithing have.